With the survey in its fifth year we are able to record and report and number of changes and the results provide a useful oversight of priorities for our Members and the sector in general. Responding to the survey is an important way for Members to inform the priorities for ALT as part of the wider aims set out in ALT’s Strategy 2017-2020 and we are grateful to everyone who took some time to complete the survey. The survey highlights very good awareness of the Senior and Associate CMALT pilots, which have been announced as launching on 28 February 2019. In terms of ALT activities that support research, practice and policy there is greatest awareness of day events and webinars run by local Member Groups, which were also indicated as one of the top priorities for 2019. This area will in part be supported by the new ALT Assembly which met for the first time on 20 February 2019. 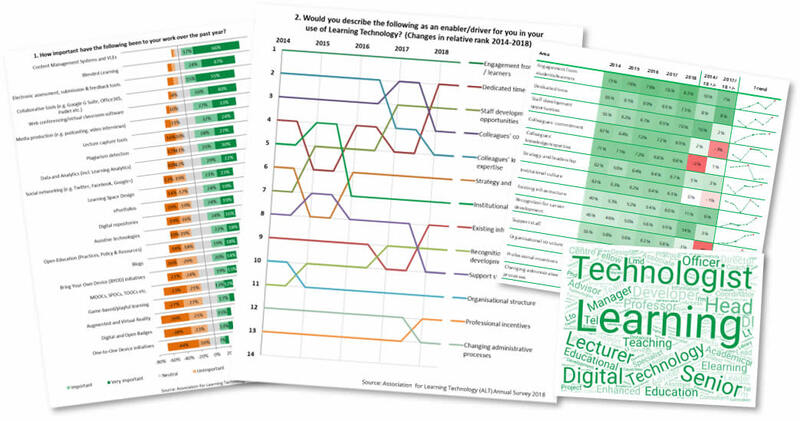 As with all previous ALT Annual Surveys the top enabler/driver for the use of learning technology is examined. In this area ‘Engagement from students/learners’ remains the top driver but this year saw ‘Dedicated time’ having the biggest change jumping from ranked 5th to 2nd. Taking in to account the survey results since 2014 the areas that have seen the biggest increases are ‘Professional incentives’, ‘Staff development opportunities’ and ‘Recognition for career development’. The combination of increasing importance of ‘Staff development opportunities’ and ‘Recognition for career development’ underlines the importance of ALT's role in leading professionalisation and recognition for Learning Technology professionals. As with previous surveys ‘Content Management Systems and VLEs’ remains the top area of importance within current and future practice. ‘Blended Learning’ has overtaken ‘Electronic assessment’ in terms of ranked importance for current practice, but ‘Electronic assessment’ remains ranked second for future practice. ‘Lecture capture tools’ saw the greatest jump in importance in current practice, moving from 14th to 6th. ‘Assistive technologies’ continues to see strong increases in the importance for current practice. Looking ahead to future priorities ‘Content Management Systems and VLEs’ and ‘Electronic assessment’ remain the top two future priorities. When comparing responses to last year’s survey ‘ePortfolios’ and ‘Assistive technology’ have seen the greatest increases in importance for future practice.